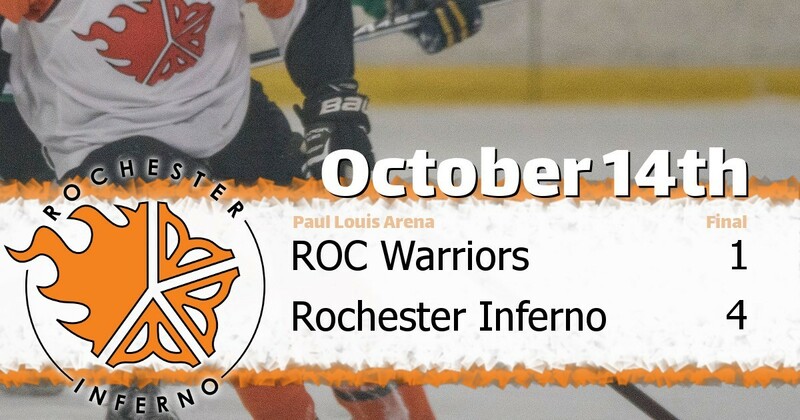 PAUL LOUIS ARENA, October 14, 2018 - The visiting ROC Warriors took on the Rochester Inferno (D-) in a matchup on Sunday. The Inferno defeated the Warriors 4 to 1 at Paul Louis Arena. This was the 2nd match-up between these two teams, and their last matchup was won by the Rochester Inferno 8-3. The Rochester Inferno leads the series 2-0-0. The Rochester Inferno had 7 players that made the scorecard. Adam Keymel had 2 goals (2 points). Jason Offord had 1 goal and 1 assist (2 points) and was whistled for 2 penalty minutes. Brian Walsh had 2 assists (2 points) and was whistled for 2 penalty minutes. Michael Atseff had 1 goal and was whistled for 2 penalty minutes. Tim Daly had 1 assist. Kevin Brolly had 1 assist. Dave Nau was whistled for 2 penalty minutes. Adam Keymel was awarded the try hard taco.